The Evoke-2S with its Clearsound technology and high-quality tweeters is noticeably better than its predecessor and its rivals. Sound quality is spot-on and the features are very useful indeed. Although not cheap and quite bulky, it sets standards. 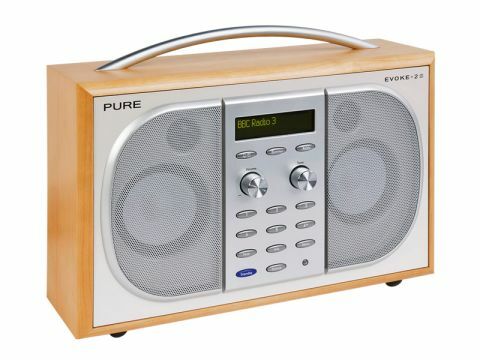 The latest version of Pure's Evoke DAB/FM radio, the 2S, includes a number of key improvements that take the audio performance to a new level. The most significant include the addition of high-quality tweeter units – taking the Evoke's speaker system two-way – plus Pure's digital end-to-end audio subsystem, Clearsound. There's also a new digital power amplifier that Pure claims delivers 30 watts, plus an impressive new OLED display that shames the LCDs of old and is a pleasure to use in both light and dark listening conditions. The Evoke-2S receives both DAB and FM, using the same tuner module and aerial, the latter being the usual telescopic, swivel mount type that can be quickly adjusted to suit either band (typically vertical and about 40-45cm long for DAB, horizontal and 75cm or so for FM). 3.5mm jack sockets at the rear cater for a single line input, line output and headphones, while power is sourced from the mains or a Pure 'ChargePAK' rechargeable battery. Apart from various alarm clock and timer functions, the most interesting addition from an audio point of view is 'ReVu', which allows you to pause, rewind and fast forward by several minutes. With the additional features of intellitext and textSCAN, you can pause and browse the accompanying scrolling information broadcast by the station. There's no doubt in our mind that adding the tweeters has improved the sound quality significantly. Single drive units are all very well (after all, some highly regarded speakers use that approach) but their dispersion is often relatively poor, making the sound particularly variable as one moves around the room. In this case, there is quite good treble in most directions and speech intelligibility is definitely better than we found with earlier Evoke models. There's also some good life and verve in music. We found this radio particularly successful with BBC Radio 3 on digital, the uncompressed sound coming across cleanly and pleasantly, while the high-frequency 'warbling' that tends to characterise DAB sound through true hi-fi equipment is much less noticeable when played through a table radio. Radio 4 also did well, as did some lighter-textured varieties of popular music broadcast on Radio 2. The Evoke 2S's improved sound quality is down to more than just the new tweeters, however. Pure's Clearsound suffix describes its digital end-to-end audio subsystem, which uses high-quality class D amplifiers and digital audio shaping technology to provide clear dynamics with low power consumption to suit the times. Compared directly to the original Evoke 2, the new model is noticeably better in terms of clarity and coherence and especially speech intelligibility. Crucially, though, it remains unflappable even when pushed to maximum volume. Throw high-quality music files at it (from iPods etc) and the output remains composed right up to the output's limit, which we found impressive. We'd say this is an excellent radio for speech, very good for music, and certainly an improvement on Pure's previous models. When you consider its impressive features, stunning display and ease of use, the Evoke-2S really does sit at the top of the pile when it comes to DAB/FM portables.